The Beam IsatDock LITE for Inmarsat’s IsatPhone Pro allows for a semi-permanent installation on a variety of applications where easy access to standard voice and *data services is required for land and sea applications. The IsatDock LITE enables the IsatPhone Pro to be always on and ready to receive incoming calls, that can be answered via a Bluetooth accessory or the optional privacy handset. 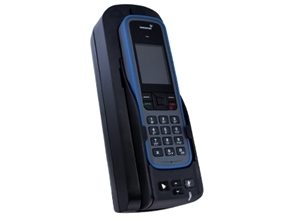 The IsatPhone Pro handset, fits securely in the Dock which is also key lockable, other features include phone charging, USB *data port, inbuilt ringer and allows antenna and power to be permanently connected to the Dock ready for use. The IsatPhone Pro handset is easily inserted and removed by the press of a button on the top of the dock making it very easy to use away form the Dock when required.